I was reminded on a recent trip that a few simple ingredients can make an elegant dish. 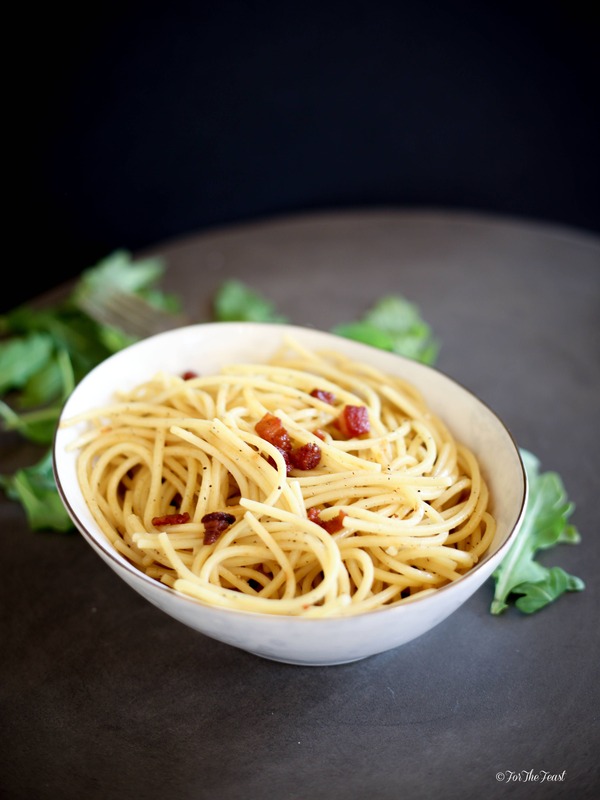 This Pasta, Pancetta, and Parma Cheese recipe is one of them. It’s a lesson I know but sometimes forget. Keep this recipe for hectic days when you feel like you have no time. The combination of Pepper and Parmigiano-Reggiano cheese is already a win but when you add pancetta it certainly gives it a boost. Pasta: Since we are using just a few ingredients for this dish – they matter. Buy a good quality Pasta and DON’T over cook it. For this specific dish I recommend cooking the pasta 1 minute under what the box suggest. I have this noted in the recipe below. Cheese: Make sure to have a wedge of cheese that you can grate fresh. I suggest Parmigiano-Reggiano or Grana Padano. You can find them in the deli section where they have the brie and blue cheeses. Pancetta: I have found 4 oz containers of pancetta already cubed in the deli section of a few stores. If you can’t find it ask a person behind the deli counter. Sometimes it’s hidden in places you might not think to look in. This happens to me a lot when I am searching for specific ingredients. 1. Bring a large pot of water to a boil, add 2 teaspoons of salt to the water once it starts to boil. NOTE: Cook pasta 1 minute less than package directions. 2. Meanwhile in a skillet saute the pancetta for 2-3 minutes until crispy. 3. Drain pasta and toss with olive oil and butter. 4. Next drain the pancetta to get all of the grease out. 5. Fold the pancetta and cheese into the pasta and give it a toss mixing it together. 6. Pepper to your taste and give it another swirl and serve!